Book Your Shore Excursion Here! If you want to see Western Europe’s main highlights but don’t have a lot of time, this European tour is the vacation for you! 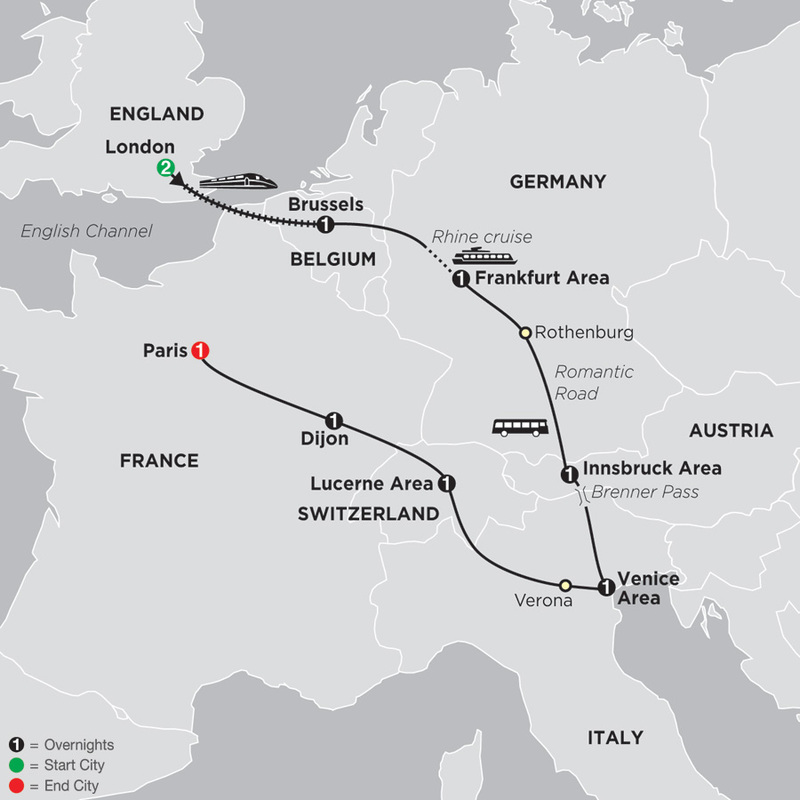 Visit England, Belgium, Germany, Austria, Italy, Switzerland, and France with overnights in London, Brussels, the Frankfurt area, the Innsbruck area, the Venice area, the Lucerne area, Dijon, and Paris. After spending some time in London, you’ll travel to Brussels on the Eurostar train, the easiest way to connect the two European cities. You will then carry on by tour coach along Germany’s Romantic Road, a trade route during the Middle Ages and now known for its charming villages, cobblestone streets, walled cities, half-timbered houses, and scenic countryside. You’ll visit one of these medieval towns, Rothenburg, a walled town that has retained its fascinating character. Relax and take in the wonderful views of castle-crested hills, terraced vineyards, and pretty wine towns on the included scenic cruise along the Rhine River. Take a boat ride in Venice along the Giudecca Canal to St. Mark’s Square, allowing you to admire some of the palazzos and maze of streets. 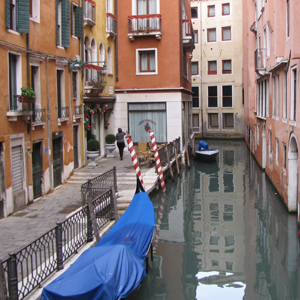 While in Venice, take the opportunity to watch glassblowers create their works as they have done for centuries. Some other must-sees on this iconic Europe tour are romantic Verona, the Italian city made famous by Romeo and Juliet; Lucerne, one of Switzerland’s finest cities, situated on the shores of breathtaking Lake Lucerne and nestled within the snow-capped Swiss Alps. And, last but not least, Paris, capital of France and one of the most celebrated cities on the old Continent. Here, your tour guide will show you some of the most famous sights in Paris-including the Arc de Triomphe and Eiffel Tower- on the city sightseeing tour. In a short period of time, this affordable European tour offers it all-historic sights, big cities, quaint towns, and scenic beauty. It’s a marvelous vacation! Cosmos travelers know travel. And they know what’s important once they reach their destination – the sights, the scenes, the locals and the legends. So we get them exactly where they want to be, from the City of Brotherly Love to the City of Light; from the Great White North to Northern Africa and from amazing South America to stunning Switzerland, no other travel company matches our expertise, on-trip experiences – with a great mix of included excursions and free time – and value. Spectacular train rides, breathtaking cable car ascents, overnight cruise ships, scenic day ferries, private first-class motorcoaches (most with free Wi-Fi) - Cosmos offers a wonderful variety of transportation for a memorable travel experience. And you never have to worry about getting to the ferry on time, buying tickets for the train, or waiting in long lines to take the cable car. Our tour packages include guided sightseeing and scenic highlights that reveal the best of Europe, U.S., Canada, Asia and South America. Bask in the beauty of Italy, America's National Parks, the Canadian Rockies, the mysteries of the Inca Empire in Peru, and so much more. Enjoy inside visits of the must-see sites with knowledgeable Local Guides who will bring each destination to life. We build free time into every Cosmos vacation, so you can eat, shop, and explore the way you want. Whether you’re into art, music, food, wine, history, or whatever, we give you the freedom to truly personalize your trip with optional excursions that are meaningful to you. When it comes to meals, Cosmos strikes a perfect balance. We include some meals to save you time and money, yet we also leave enough free time so you can sample your destination’s gastronomic delights on your own. After a day of traveling you want to relax at a comfortable, clean, and attractive hotel. We select hotels with the best guestrooms (always with a private bathroom), service, and food for the money. At the heart of every great Cosmos tour are the friendly, knowledgeable folks who show you around and help you maximize your free time. We go to incredible lengths to find the most professional Tour Directors and Local Guides.